Turn’s out I’m a big old softy at heart, my girlfriends kids made yesterday “John’s Day” and “Mummy’s boyfriend day” as a substitute to Fathers day. They’d made me cards with lovely messages and spent ages making me presents, took all I could not to blub there and then when they gave them too me. 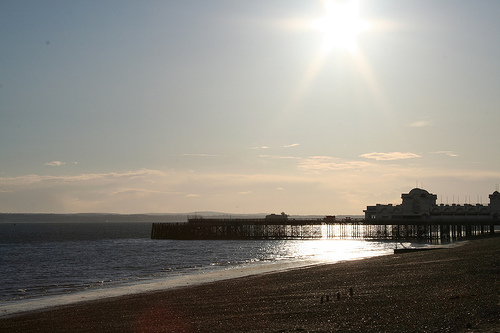 After that we all went down to play on Southsea beach and eat ice cream. The evening was my girlfriend and I going out for a very nice dinner with my folks at Edwinns in Fareham. Great days like this were not even dreamed of when I was drinking and took a while to start happening in recovery but I’m bloody glad I stuck with it and got the opportunity to live a life full of The AA Promises. Image by villageidiot under CC licence. A recent copy of Reader’s Digest has a couple of articles on Alcoholics Anonymous. The crux of the articles is that the famous 12 Steps, don’t work at all. Apparently, there’s no data to support the claim that Alcoholics Anonymous is successful at getting people to stop drinking. From my own experience, the 12 Steps, shut down the critical thinking section of ones brain. What do you think? Comments are welcome!! That is really sweet. Sobriety really does bring us moments to cherish. At one time in my life I could never have appreciated this. Today I soak it all up. Hiya! Always nice to meet new sober people online. Welcome to our sober blogging community. Awwwww that is a gift. How special and alive you must have felt. Such actions are so huge, and I know you felt the wonderful impact of them. Kenny sent me over. Nice blog! Come over and visit mine. Thanks for stopping by my place. Nice blog you have – more of a proper website than a blog! Have a good, sober day. ps will link you. Ta for linking me.